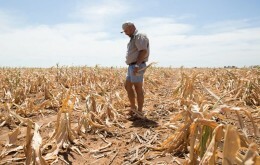 As the following Black-centric BBC report shows, South Africa is suffering the most severe drought in over 30 years. This is afflicting both Whites and Blacks in the agricultural areas, but the anti-White ANC government is content to sit back and allow the drought to slowly push the largely White-run farms to the brink so that party functionaries can benefit by White dispossession. With already 119 racially-based laws aimed at advancing Black interests, the ANC government has zero interest in helping White farmers, even though the country’s food supply is dependent on them. Just as in Zimbabwe, it believes they should be driven off the land into the various squatter camps, where an increasing number of poor Whites eke out a miserable existence . The drought is helping them achieve this goal. The Front National , a political party that believes in secession and self-determination for the White Afrikaner population, is doing what it can to help White farmers whose livelihood has been devastated by this terrible drought, and has set up a “Go Fund Me”  donations page. The money raised will go towards alleviating the suffering of the White farming community. This is a worthy cause for all racially aware White people to support. Your donations are much appreciated.